After a few days of intense negotiation and pouring over the contracts and rules of the match, FIDE President Kirsan Ilyumzhinov decided to uphold the forfeit awarded when Vladimir Kramnik refused to play game five. Kramnik's view was that the World Chess Championship Appeals Committee made an improper decision by entertaining the complaint by the Topalov team by changing the bathroom arrangement. 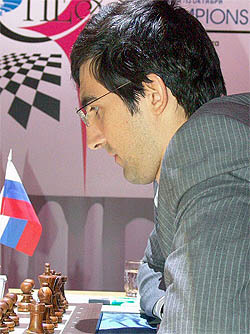 Kramnik argued that both sides had agreed on the conditions of the match and should not be changed. Kramnik sat in the resting room before game five and demanded that the adjoining bathroom be opened. When his demands were not met within the hour, he forfeited the match. 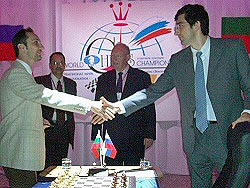 Veselin Topalov and Vladimir Kramnik shake hands before game six. Photo by worldchess2006.com. The furor created by Silvio Danailov's charges that Kramnik acted susupiciously, put the match in jeopardy. There was serious speculation that Kramnik's management (led by Carsten Hensel) would nix the match if the forfeit loss was not overturned. However, Kramnik wrote a statement expressing what he believed was a higher cause. What is clear is that Kramnik has emerged from this debacle looking like a hero and the Topalov team appears to be the villain in this saga. Kramnik also received the support of seven Grandmasters from seven different countries. What is interesting is that one of the Grandmasters (Tomi Nyback) was himself the center of a controversy at the 2006 Olympiad where he allegedly retracted a move in full view of his opponent and witnesses. This letter of support stated that Kramnik suffered a gross injustice and is subject to immense psychological pressure. While no one can dismiss the strain on Kramnik, game six proves that he has at least been able to continue the match. There was also speculation as to whether Topalov would shake hands with Kramnik, who had visited his bathroom on numerous occasions during the match. Topalov had stated he would not shake hands for sanitary concerns. However, when the two opponents met for game six, they shook hands without hesitation. Topalov certainly realized the ill-will he caused by such statements. Game six continued the match trend of Topalov playing aggressively, but being unable to convert a win against Kramnik's stubborn defense. Mihail Marin annotated game six and declared a positional advantage for white, but stated that it was difficult to make much of it. In the end, Kramnik erected a solid defense and the game was drawn in only 31 moves. Topalov will need to penetrate Kramnik's defenses in the remaining six games. This is something that not even Garry Kasparov was able to do in the 2000 Kramnik-Kasparov match. Game seven will take place on Wednesday. After being ridiculed for uninspiring tournament play and tendency for draws, Vladimir Kramnik's image has been rejuvenated and will forever be known for his stand in this match. Photo by worldchess2006.com.